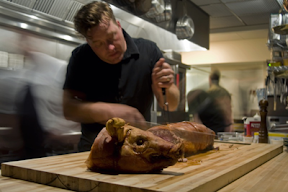 Lecosho: Matt Janke and crew stick a pork in it. Done! I finally got to Matt Janke’s latest effort, Lecosho, open since late September. And though I’m sorry I missed my opportunity to sip and sup at happy hour, I was happy to be there as the sun set over Elliott Bay on a quiet weekday evening, and happier still when I realized the woman who greeted me at the door was Sara Moot. You may remember Sara from her eight year-gig as co-owner of Persimmon in Fremont, closed last summer and since re-opened under new ownership as Hunger. You may even recognize her from her other part-time gig, at Spinasse. When one door closes, another opens: Sara Moot, tending tables — and the door — at Lecosho, open since late September on the Harbor Steps, at 89 University Street between First and Western. At Lecosho, now serving lunch and dinner, I was intrigued to find that rather than a fabulously funky space built in the image of Matt’s namesake-restaurant in the Market (now owned and operated by his former business-partner), this one — with its sleek wood accents and windows overlooking the Harbor Steps — brought to mind the grown-up elegance of Campagne. Lecosho, from the outside looking in. Here, adult beverages (like the pitch-perfect Negroni I savored) are poured in healthy measure at the long bar situated on the left, while tables on the right offer sight-lines of the bar and open kitchen. There, chef-exec Mike Easton practices his considerable knife-skills, preparing signature specialties like pork-belly rillettes, porchetta with white beans and baby turnips, and grilled octopus outfitted with chickpeas, salsa brava and Mama Lil’s vinaigrette (I highly recommend the later, having made its tender acquaintance). Chef Mike Easton, left, butchers his Lecosho (Chinook for swine) in-house . Meanwhile, I made short work of the grilled octopus with chickpeas, salsa brava and Mama Lil’s pepper-vinagrette. Ms. Moot and Mr. Easton aren’t the only familiar faces at Lecosho, where the vibe is delightfully casual. You’ll find Matt on hand, too, schmoozing customers and helping keep things running smoothly, along with sous-chef Meredith Molli, late of La Boucherie on Vashon Island. I’m plotting my return as I write, when perhaps I’ll meet Matt’s new business partner, Jill Buchanan. So, anybody else been to Lecosho yet? What’s the word? Sous-chef Meredith Molli at home in the kitchen with Matt Janke.